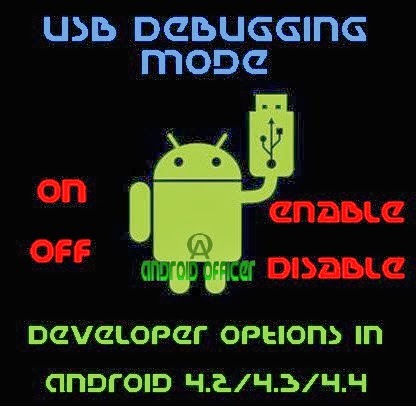 Enable/Disable Developers Options, USB Debugging last updated on 11-Feb-2016. USB transfer is the main medium to travel our import data from Smartphone or tablet to PC. We can gain access to our android devices right from computer system by connecting them through USB and transfer important data. No matter whether you are an advance android user or an average android user, you wish to update official firmware, root, install custom ROM or MOD on your android device. And to do all these, you must connect your device through USB. You do not need to do anything to activate USB transfer feature as it is enabled by default in most android devices. However, if you wish to disable USB transfer then you can do it from your phone Settings menu. USB transfer is known as USB Debugging which can be found under Developer Options in Settings menu. Along with USB Debugging, there are many useful features you can found under Developer Options. Some of the most useful features of the Developers Options includes- Enable/Disable USB Debugging, Capture Bug Report on device, display CPU usage on screen, draw debugging information on screen and many more. If your device is running on Android 2.3 Gingerbread, 4.0 ICS or 4.1 Jelly Bean then you can easily find the Developer Options in Settings menu but if your device have Android 4.2 Jelly Bean, 4.3 Jelly Bean or latest Android 4.4 KitKat then you need to do some extra effort to enable Developer Options. 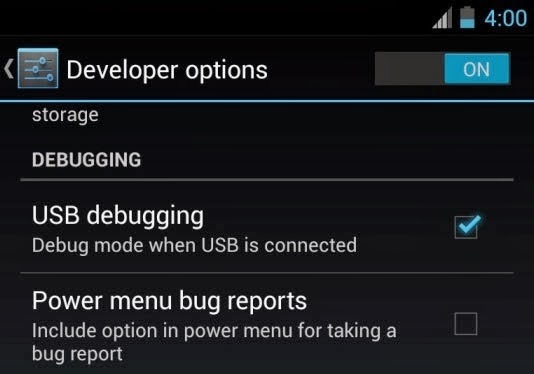 Check out the below guide to Enable/Disable USB Debugging on different android versions and also Enable Developers Options in Android 4.2 or higher android versions. Those who updated their device to Android 4.2 Jelly Bean or higher or having a 4.2 JB or higher android powered device, will not found the Developers Options in Settings menu. 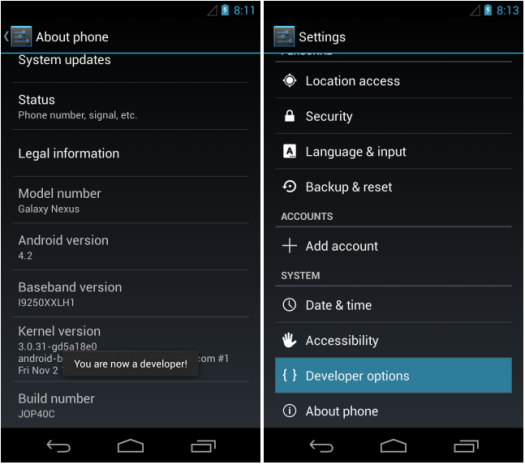 The Developers Options hide by default on 4.2 jelly bean and later android versions. Follow the below steps to Unhide Developers Options. Well, after activating the Developer Options on Android 4.2/4.3/4.4 by tapping the build number 7 times, it remains visible under settings menu and there is no such option to Hide Developer Options as it was before. However, if you wish badly to hide the Developer Options from your android device then you can do it by doing a Factory Reset your device. If you wish to do it then turn off your device and boot into Recovery Mode and do “data/factory reset”. This is the only solution that you can try at this moment. On my Galaxy Tab 3 8.0 with Jelly Bean, enabling Developer Mode means that software updates cannot be done without removing the SD card (at least with my 64 GB card) any powering back up. THIS IS TRUE EVEN IF YOU TURN OFF DEVELOPER MODE! So far I have found no workaround! Just go to Application manager -> Settings and hit Clear Data to hide Developer options again. i recently buy a mobile which runs on android 4.4.2. i enabled developer option.i have 2 peace of that phone.1 is in normal mode another is in developer mode.i updated Google maps in both mobile. google map 9.0 version downloaded in developer mode mobile and google map version 8.4 downloaded in normal phone. 9.0 version is not available on play store. is this normal? is it caused because of developer option? developer option is harm full for mobile? On my Galaxy Note 8.0 (GT-N5110) with Android 4.4.2 nothing happens after I enable USB Debugging. No additional screen asking me if I want to go into debugging mode when connect to USB, no additional drives on my Win 7 Home Premium PC. What am I missing? It's so simple to disable developer mod; Just go to settings-Apps-all-settings-clear catch. Its done. clear catch?? you mean clear data? i dont have build number in my qmobilei9 jelly bean 4.4.2, plz guide mewhat todo? 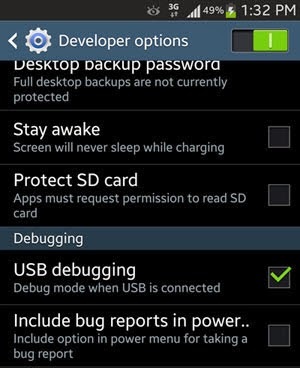 i enabled usb debugging mode in Samsung galaxy grand mobile but when I connect to my pc it is showing that "usb debugging mode is in disable mode please enable it"
Please guide me with the solution.. Thanks for an valid information ..
Where is th developer option of galaxy grand 2 ,model No:-SM-G7102 , and android version :-4.4.2 .....Please contact mi fast on sasandip006@gmail.com ,or reply here. does not serve the screen? and you have no way to get to any of these options? that otherwise is enabled ?